Today nearly 50 million Americans live below the poverty line. It is a statistic that is, perhaps, too large to mean much—a statistic that doesn’t get as many headlines as, for example, police brutality against unarmed black men, but one that does just as much violence. The class crisis in the United States is so complicated that meaningful dialogue surrounding it has been avoided by popular media. 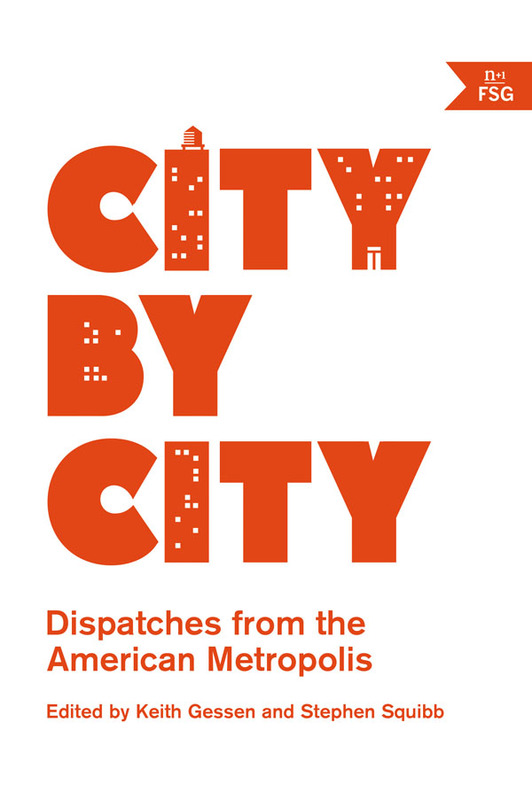 And so,City by City: Dispatches from the American Metropolis comes along as a kind of answer to the question: How did we get here? This collection of personal and historical essays (and one interview) is an intense investigation into where we come from, where we are, and perhaps most importantly, where we are headed as a nation. City by City compiles pieces that originally appeared in an N+1 online series. The project, launched by N+1co-editor Keith Gessen and writer Stephen Squibb, was prompted by the 2008 economic collapse. While we know that money equals power, these essays, written between 2009 and 2014, depict the myriad nuanced ways that this power manifests itself: that the location of a new highway reflects and reinforces power; that the racist and rich civic leaders of yesterday are today’s instigators of urban segregation; that the gentrification of America’s trendiest neighborhoods is the reversal of the “white flight” of the 1960s and ’70s; that the displacement of poor people and people of color is a problem as old as America; that police brutality and systematic violence are inextricably tied to civic money and power; that class is an issue so vast and complex, we as a country seem unable to find any tenable solutions. While issues of class permeate every page of City by City, the essays are intrinsically tied to place. Contributors explore major metropolises, such as Atlanta, Los Angeles, and Washington D.C., but also tackle small rural towns like Whittier, Alaska, and Williston, North Dakota, towns where a boom economy—like Williston’s fracking industry, which by 2014 “had nearly doubled North Dakota’sGDP,” or Whittier’s explosion of reality television production—illustrate that cities of all sizes run on a capitalist culture. In effect, this broad accounting of America’s cities and towns demonstrates that to survive, whether large or small, you must participate in this system. The book’s structure reflects this blended approach, too. Each hard-hitting factual essay arrives at just the right moment, creating a strong narrative with a satiating intellectual and emotional pull. City by City opens with Jordan Kisner’s exploration of her hometown of San Diego, in which she employs a personal writing style to depict the stark economic extremes that exist in this “famously mild” city. And this idea of extremes—from the destitute to the wildly rich, from starkly white to completely black neighborhoods—haunts every page. So that by the time we arrive in Syracuse for the final essay, it reads as a conclusion to a larger story. In fact in many ways, it is the most American story of them all, telling the tale of a massive mall, a “kingdom of conspicuous consumerism” as the writer, Steve Featherstone, puts it. At the height of its planning, mall developer Bob Congel, the mastermind of Destiny USA (the mall’s unironic name) anticipated creating a “hundred-million-square-foot Frankenmall that would cost $20 billion to build,” as Featherstone describes it. While these grand plans collapsed in the wake of the 2008 financial collapse, Destiny USA was built, if only as a “mere shadow” of what Syracusans were promised. And it is difficult not to see the irony in that. There is a paradox at work throughout the book that seems to be intentional. The editors have created a collection that portrays the nation’s diversity and expanse, yet at the same time each essay reiterates the point that capitalism, first and foremost, has contributed and still contributes to the development and subsequent collapse of America’s cities and towns. As writer Ben Merriman writes in his essay, “Lessons of the Arkansas,” individuals are at the whim of the system and this demands a cutthroat mindset: “Get yours or get out.” He’s talking about the American West, but this might as well be our country’s catchphrase. While most of the essays illustrate a nationwide mindset addicted to a capitalist agenda—what Simone Landon recognizes in her essay “Saving Detroit” as “clearly a broken civic infrastructure”—Gar Alperovitz has some ideas about a kind of solution. Cleveland, a city that capitalism left behind long ago, for example, has begun to see a rise in “worker-owned and multi-stakeholder firms,” Alperovitz says, where the employees spread the profits amongst themselves. These firms provide services, like laundry, for what Alperovitz terms “anchor companies,” hospitals and universities, organizations that can’t leave a city due to an economic downturn. And so, there is at least some semblance of forward momentum, some signs pointing us toward a way out, which provides a salve after so many depressing pages. Of course, as Ben Merriman puts it, “There is no easy solution,” but at leastCity by City participates in the conversation.